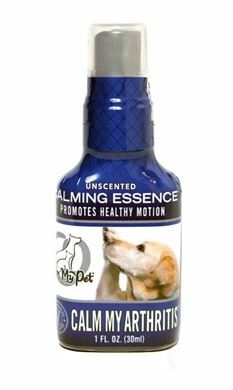 Calm My Stress is a FAST-ACTING, UNSCENTED spray to promote healthy energy balance and calm during intense stress situations for both dogs and cats. 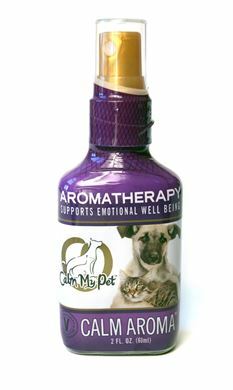 This pet calming spray helps with intense stress, worry, anxiety, trauma, car trips, vet visits, grooming, boarding, shows, storms and visitors. Additional benefits can be seen with long term use. Calm My Stress is organic, unscented, alcohol-free, and glycerin-free. 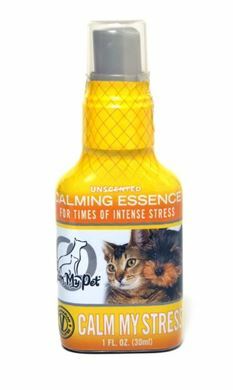 Calm My Cat is a FAST-ACTING, UNSCENTED spray to promote healthy energy balance and calm for daily use on cats. 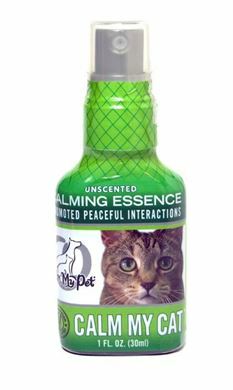 This unique cat calming spray can create more peaceful interactions between pet family members. It helps with stress, worry, cat anxiety, meowing and hiding. Use with Calm My Stress for trauma, car trips, vet visits, grooming, boarding and visitors. Additional benefits can be seen with long term use. Calm My Cat is organic, unscented, alcohol-free, and glycerin-free. 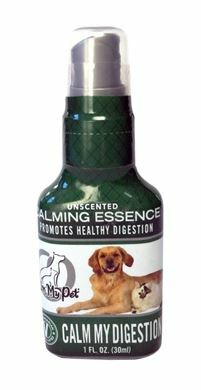 Calm My Dog is a FAST-ACTING, UNSCENTED spray to promote healthy energy balance and calm for daily use on dogs. This unique essence can help with worry, anxiety, trauma. Use with Calm My Stress for car trips, vet visits, grooming, boarding, shows, storms and visitors. Additional benefits can be seen with long term use. Calm My Dog is organic, unscented, alcohol-free, and glycerin-free. Calm My Focus is a FAST-ACTING, UNSCENTED spray to promote healthy energy balance and attention and motivation. This spray helps with training, competitions, high energy, stress and anxiety. Additional benefits can be seen with long term use. Calm My Focus is organic, unscented, alcohol-free, and glycerin-free. Calm My Rescue is a FAST-ACTING, UNSCENTED spray to help ease transitions in new situations and households. This spray is recommended for letting go of stress, trauma, fear and anxiety from earlier in life. Additional benefits can be seen with long term use. Calm My Rescue is organic, unscented, alcohol-free, and glycerin-free. 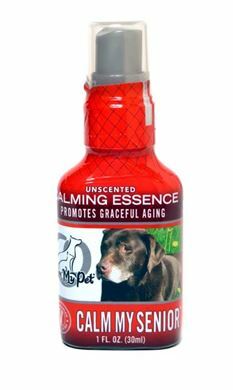 Calm My Senior is a FAST-ACTING, UNSCENTED spray to promote healthy energy balance and calmness in senior pets. This spray helps with relaxation, easing discomforts, and memory. Additional benefits can be seen with long term use. Calm My Senior is organic, unscented, alcohol-free, and glycerin-free. Calm My Arthritis is a FAST-ACTING, UNSCENTED spray to promote healthy joints and movement. This spray is recommended for arthritis, discomfort, muscle/joint soreness and overuse. Additional benefits can be seen with long term use. Calm My Arthritis is organic, unscented, alcohol-free, and glycerin-free. Calm My Digestion is a FAST-ACTING, UNSCENTED spray to support healthy weight or for occasional or chronic digestive concerns. Additional benefits can be seen with long term use. Calm My Digestion is organic, unscented, alcohol-free, and glycerin-free. 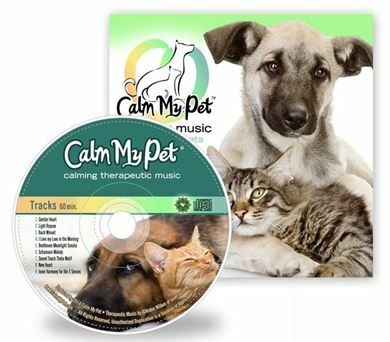 Calm My Pet CD is therapeutic music for relaxation that helps pet cope with common phobias. Relax, meditate and share this special time with your pet. Feel the deep loving bond with your companion through this relaxing music CD. 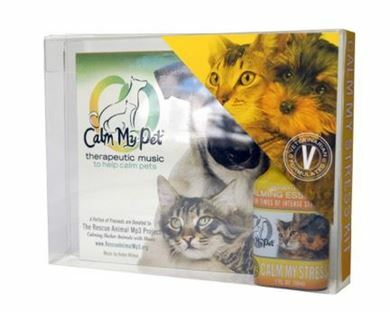 Calm My Pet Music CD contains specific musical compositions lovingly selected by Pamela Fisher, DVM to help pets cope with common phobias such as thunderstorms, household noises and stress. The special vibration of this music by Arden Wilken creates a harmonious environment for your animal companions while also improving their health and behavior creating a relaxing environment. Arden Wilken has been a sound therapist for 37 years and recorded this music with SSRS (Spectrum Sound Resonance System) to enhance the relaxation effect with psychoacoustic frequencies. 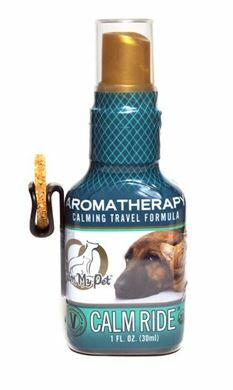 Calm Aroma is the highest quality therapeutic dog aromatherapy (100% hydrosol) hand selected and formulated by Dr. Pamela Fisher to help animals with a light scent to soothe your pet. Gently spray pet, bed & toys to encourage calmness. Turn a STRESSFUL CAR RIDE into a CALM RIDE! Calming & easing motion sickness for your pet on any journey with essential oils. Comes with an Aroma-Disc to easily diffuse calm scent in the car. Calm Ride consists of the highest quality essential oils for pets. Includes FAST-ACTING, unscented pet calming spray and SSRS Music for calming and promoting healthy balance in pets. 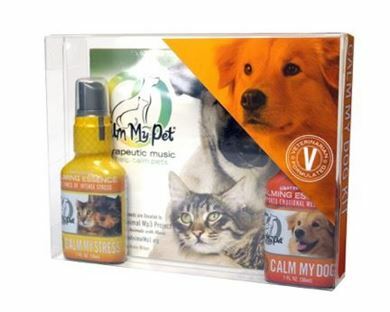 Kit includes Calm My Stress and a Calm My Pet Music CD. 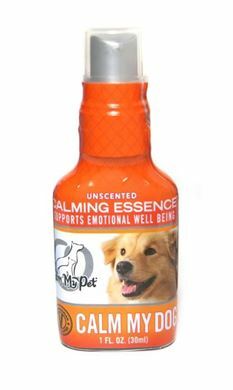 Use Calm My Stress Essence for worry, stress, anxiety, trauma during car trips, vet visits, grooming, boarding, shows and visitors. Use this in combination with Calm My Pet Music CD for the ultimate relaxation experience for pets. 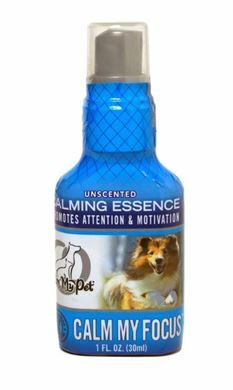 Includes FAST-ACTING, UNSCENTED sprays and SSRS Music for calming and promoting healthy balance in dogs. Kit consists of Calm My Dog, Calm My Stress, and a Calm My Pet Music CD. Calm My Dog is for daily use and common stresses. Calm My Stress is for calming during intense stress situations, such as car trips, vet visits, grooming, boarding, shows and visitors. Use these in combination with Calm My Pet Music CD for the ultimate relaxation experience for dogs. 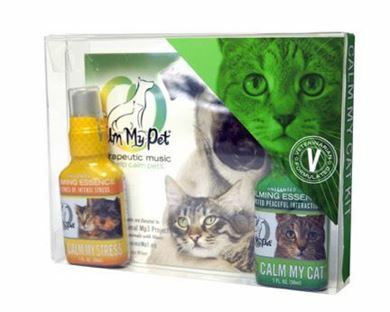 Includes FAST-ACTING, UNSCENTED sprays and SSRS Music for calming and promoting healthy balance in cats. Kit consists of Calm My Cat, Calm My Stress and a Calm My Pet Music CD. Calm My Cat is uniquely formulated for daily use and cat specific stresses. Use Calm My Stress for calming during intense stress situations such as car trips, vet visits, when hiding or meowing and visitors. Use these in combination with Calm My Pet Music CD for the ultimate relaxation experience for cats. Includes FAST-ACTING, UNSCENTED rescue pet calming spray and SSRS Music for calming and promoting healthy balance in pets. 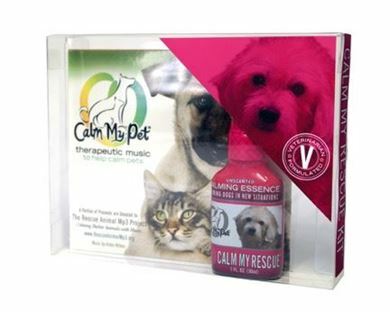 Kit includes Calm My Rescue and a Calm My Pet Music CD. Use Calm My Rescue Essence for letting go of worry, stress, anxiety, trauma in for your rescue pet in new situations. Use this in combination with Calm My Pet Music CD for the ultimate relaxation experience for pets. Includes FAST-ACTING, UNSCENTED sprays and SSRS Music for calming and promoting healthy balance in senior pets. 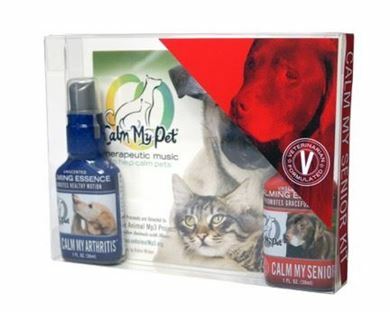 Kit consists of Calm My Senior, Calm My Arthritis and a Calm My Pet Music CD. Calm My Senior is for relaxation, easing discomforts, and memory. Calm My Arthritis is recommended for arthritis, discomfort, muscle/joint soreness and overuse. Use these in combination with Calm My Pet Music CD for the ultimate relaxation experience for your senior.